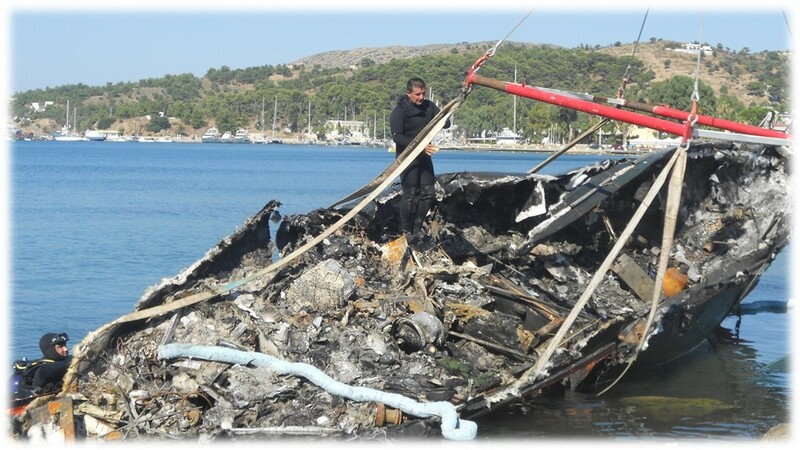 It has taken some time to be able to put pen to paper after the events in Leros on 5th July 2013. After leaving Nisryos we sailed to Pserimos and then to Leros. We caught up with friends on Jespan, Octavia and CrazyDream and even celebrated our wedding anniversary at a super restaurant in Petlani on the Island. We got a very good offer so decided to take the boat out on land for 3 days to antifoul and check her over. All went according to plan and on 5th July we launched her at 11h15. By 12 noon we were out at anchor in the bay and we left her to go ashore to visit the island by car with Jespan. We waited for them to arrive with the car and about 13h00 we started off. 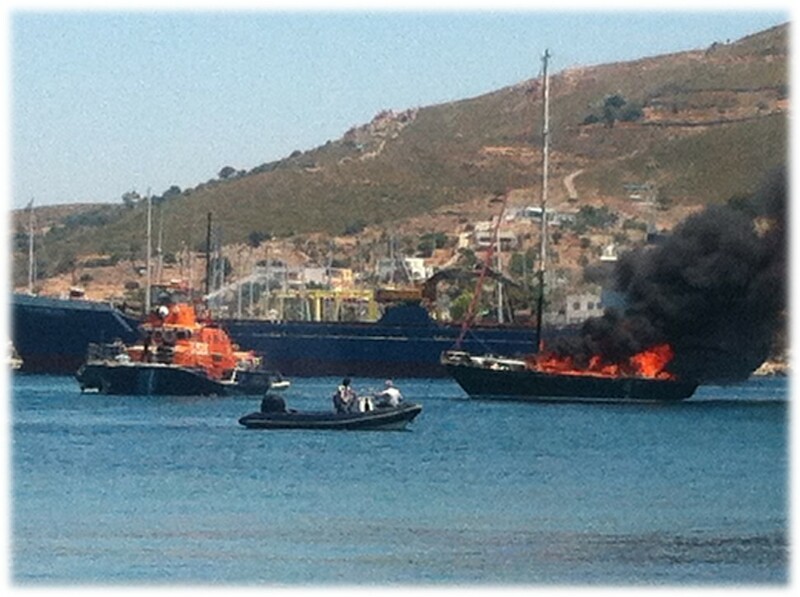 At 13h15 we received a call from the marina to return to the boat as it was on fire!!! We quickly turned round and then had to wait on land whilst attempts were made to put out the blaze. Needless to say these were fruitless and she eventually burned for 8 hours. We had lost our home and everything we possessed except what we had taken off the boat with us and the clothes we stood up in. Everyone was fantastic. Jespan lodged us on the boat and Crazy Dream gave us clothes and other essentials. People in the marina and elsewhere came with clothes and other items to help us out. Svein to and froed between the Port Police and the marina to try to sort out what would happen next as we did not want her to sink and cause further problems. Unfortunately there was little help from the official authorities but in the evening friends rallied round and with our dinghy and another one she was pulled aground into shallow waters (still burning). Eventually a military fire vehicle with foam appeared and Svein took them out to the wreck to extinguish the remaining flames. It still took them one hour and by now we were nearly 20h00. After much hassle an anti-pollution barrier was placed round the wreck and then began the fight to get her on land. After nearly one week we were finally able to have the wreck brought ashore. She is now being broken down in a yard in the north of the island. Once everything was sorted out we were able to leave Leros and we headed for Athens for a new passport for Svein and then Rhodes where Per and Elly on Sybaris had kindly lent us their house. We stayed there for a week until Per’s parents arrived and we had to move to a flat for the duration of their stay. We returned to the house whilst we waited for Caryn’s passport. Once it had arrived we headed for Nisryos where we stayed with Marilyn and Mike in Nikia with visits to Pali to be spoilt by Tsambica and Nikos at Aphrotide. From there we organised a quick trip to Kos so that Caryn could have her check-up and then we were free to move on. Svein had been assiduously studying the internet for another boat and had lined up possibilities in Greece, Italy, Malta, Spain and France. It was time to start travelling. We collected our 3 suitcases and booked the ferry to Athens. Here we had a car waiting for us and we travelled to Kalamata to see the first choice. Unfortunately it was not to be. So we said goodbye to our friends there and moved on to Lefkas. Here we had several lined up. The first one was not suitable but the second one was. We are now in the process of buying a Bruce Roberts 48 steel ketch. We already knew the boat as Caryn had sold it in France in 2007 when she was working there. Small world!!!!!!!!. We shall now be able to start a new adventure. 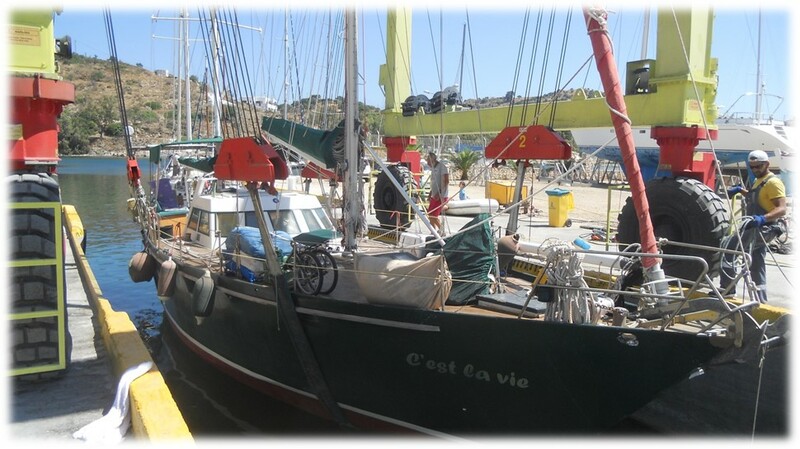 We shall be spending the winter in Lefkas marina together with our friends Angie and Keith on Castor en Pollux. It looks as though it could be a busy time as we may also go to California for a wedding and Caryn’s mother will be 90 in January so a trip to the UK will be in order. Svein will also have to find time to work on the boat to put our stamp on it and Caryn will have fun setting up the galley and replacing everything. What a shopping spree in perspective. The new Escapade blog continues her. Bright and early we were up and drove to Lidl to stock up. A trip to town for some last minute things and by 11am we were ready to leave the marina. Our original intention was to anchor in Yiali for a night but after a phone call on the way down we diverted to Pali on Nisyros. We had to motor all the way because of head winds but were soon safely moored, with our lines taken by Crazy Dream, and were able to go for a well deserved swim. We were back in Pali for the wedding of Tsambika and Niko’s granddaughter so we whiled away our time doing odd jobs on the boat, swimming and eating and drinking. The day of the wedding arrived and everything started at 7pm although the family and guests had been arriving all day and the preparations for the celebration had been going on for many days. With upto 150 guests expected it was a big event and all the village was concerned. The wedding itself was very different to anything we had seen before and it gave us an insight into the Greek way of life. Needless to say the celebrations went on long into the night but by 8am the next morning the restaurant was open for business as usual with no evidence of what had taken place the day before. The video gives a summary of the event. Once the wedding was over we were able to relax and just wait for our post. We saw the biggest moon of the century from Nikia overlooking the ocean towards Tilos. Once the post arrived we weighed anchor and left Nisyros for Kos. The journey was pretty bumpy and rounding Agios Fokas we saw 32.5 knots of wind!! We eventually anchored outside the marina and had a quiet night. Svein went into town and got his new watch that we had been waiting for and he also managed to pick up a few supplies so we would be read to leave the next day. The next day we filled up on fuel and water and headed towards Pserimos. So far we have not been lucky with the winds as the meltemi is blowing and it kicks up a big swell. We were not making much speed but eventually we reached the anchorage in Pserimos. We sent for a swim and then watched the boats around us dragging. We were lucky and did not move. Svein checked the undersides and saw that the propellor needed to be cleaned which probably explains the slow speed of the previous day. Early the next morning Svein dove and cleaned the propellor. We then started heading North again making for Xerokambos on Leros. However the sea was so choppy that we shortened the trip and went into Vathi on the island of Kalymnos instead. We arrived early and were able to get a good place. The speed of the boat has also improved by over 1 knot. We relaxed and swam and had a good dinner out. The last of June was already upon us and we headed out of the inlet and made our way North again. We were lucky and managed to hoist the sails although the wind was such that we motorsailed. However the sea was calm until we reached the entrance to Xerokambos when the wind suddenly picked up and the sea became choppy. 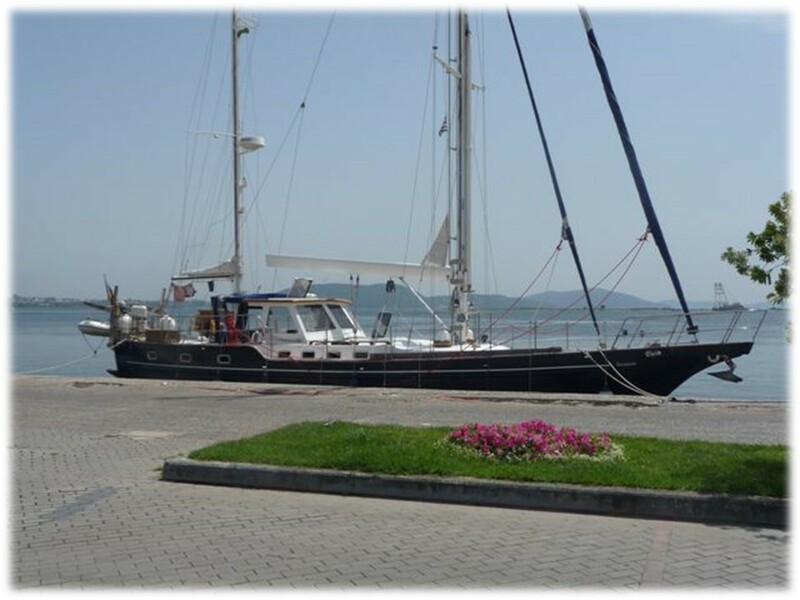 We battled on round the point and put down the anchor in the bay of Lakki between the two marinas. We have found Jespan, Octavia II and Crazy Dream here also!!!! We have decided to take the boat out here for her overhaul whilst we are waiting for a break in the weather to continue. That will be the next episode. We have had a very busy June but are now moving on to new adventures so we will see what they bring. What a busy time we had. We managed to travel by road and ferry and visited most of the family. We started with our arrival in the south at Rygge where we were met by one of Svein’s brothers. We stayed the first night near Oslo and the next day then drove, roughly 10 hours, to Trondheim. Here we took a night in a very expensive hotel before completing the next stage of the journey to our first rendezvous (the family reunion) about another 3 hours drive. We had now travelled nearly half the length of Norway and were still not at our destination. A stop on the way in Grong to see Svein’s parents and then a small hop to Hoylandet for the reunion. The 4 brothers met up and had an all night session catching up and then the next day the reunion got under way with a visit to the original family farm. This was followed by a meal and everyone catching up on the family news. Svein and some of his brothers even went for a quick dip in the river fed by the melting snow (14 degrees) to clear their heads. On Sunday we returned to Grong and spent the night with Svein’s parents before driving them up to the family cabin. Here Caryn got a shock. The surroundings were spectacular but the facilities more than primitive – an outside loo, no running water in the cabin, no electricity. It makes for a very quaint existence and truly “back to nature”. We spent a couple of days here recovering despite the cold (10 degrees) and the rain and visiting the surroundings then we were on the road again to Trondheim (with a stop in Grong) to visit Svein’s younger daughter. Once there it was a flurry to get to the kindergarten on time for the end of year show where Svein’s 6th grandchild was participating. Again the weather was not kind but we managed to include a visit to Ikea (to stock up on bedlinen for the boat) and a visit to the old town of Trondheim. Our visit here ended and it was time to take to the road again for our final family “appointment” north of the Artic circle. We drove north , stopping at Grong and the cabin on the way, and after about 6 hours reached the ferry that would take us to Jektvik. This is apparently a scenic route and the fact was proved by the number of camping cars, motor bikes and cyclists using the ferry. An hour later after crossing the Artic circle we arrived at our destination and after a couple of hundred metres we had arrived. We settled into the flat that we were to use and then sat down to a delicious dinner of prawns that were brought from the trawler directly to the table. After dinner we took the boat out and saw the midnight sun. The next day was spent recovering and catching up. Svein took Ludwig (No 3) and Ronja (No 5) and Sondre (No 7) out fishing in the evening and they caught a 15kg cod which was duly filleted at the quay and prepared for the meal to be eaten the next day when more visitors were due to arrive from all over Norway. We were also treated to a delicious dinner with salmon cooked 3 different ways. We are certainly getting our fill of fish here. Friday dawned and it was spent preparing the evening meal as well as visiting the local town. Saturday was spent in preparing the venue for the meal. The weather was bad again with low temperatures. Eventually the day of the confirmation for Ulla (No 1 grandchild) dawned and, thankfully, it was bright and sunny. There was a church ceremony followed by a meal. This had been cooked by the confirmant’s grandmother on her father’s side. The evening was spent packing as we would be leaving early the next day to drive to Namsos to catch a flight south to Sandefjordl Our family obligations were now complete. We caught the ferry and backtracked down to Grong (to pick up the parents) and finished the car journey in Namsos where we returned the car to Svein’s parents and caught a flight to Sandefjord via Trondheim. This was the easiest part of the journey and by 7pm we were installed on the terrace of our friend’s house. We had a delicious lamb dinner and a good night’s sleep. The final day in Norway we spent shopping for the last minute items we needed and enjoying the town that we had lived in over 10 years ago. We had our final meal at our good friend Mariann and Bjorn where we ate prawns whilst overlooking Sandefjord bay and the harbour. A taxi home and we were ready for bed. A quick check that nothing had been left behind and we were off to catch a ferry to cross Oslo fjord and get to the airport. After an uneventful but full flight we were back in Kos by early evening. Unfortunately the car was not waiting for us but we got a taxi and were soon safely back on the boat. As we had been unable to do any shopping on the way from the airport we treated ourselves to an Italian meal on the beach and watched the sunset over the castle. A fitting end to a 3-week trip or the beginning of the next stage and the warm weather was waiting for us. Svein has been worked off his feet. He has repaired outboard engines, gone up the mast of a charter boat to repair their genoa, gone up the mast of a Halberg Rassy to change a navigation light and also renew plugs on a teak deck. He has also acted as temporary harbourmaster when the boats poured in to be safe from the strong southerlies that were forecast and people had trouble anchoring whilst dragging other boat anchors as well. He has sanded and varnished and also found time to finish our targa, install the new start battery and do other odd jobs on our boat as well. We have had several boats that we know come into Pali so we have also had a busy social time. We saw Britt Marie and Gunnar (Jespan), June and Steve (Piper) who we had not seen since 2010 in Messalonghi, Petra (Viva) and finally Pauline and Gordon (Crazy Dream). We made two trips to Kos with a car from Eagle’s Nest. The first trip we experienced a Greek MOT test for one of Mike’s cars and we also bought a start battery for the boat. On the second trip we went with Piper so they could do a big shop and we visited the island as they had never been there before. On both occasions we went to Kardamena with the ferry and saw Andy and Carole (Zeus). We also had excellent lunches at Teo each time. We showed Piper round Nisyros as well taking in the volcano, Emporio, Nikia and the other usual sights. We were invited to join Tsambika and Nikos’ family for the traditional Greek Easter lunch and we enjoyed goat that had been stuffed and cooked in the local baker’s oven for 24 hours amongst other goodies. We shall also be returning to Nisyros for a traditional Greek wedding on our return from Norway but that is another story. We did find time for some relaxation as well as took full advantage of the beach and the warm water so that we both (yes even Svein) went swimming every day. After a month of chilling (?) out came the day to leave and return to Kos so that we could organise the boat and prepare our departure to Norway. We leave today but the boat is safely tucked into the marina (although it is costing an arm and a leg as the marina now only has 3 rates – daily, 180 days or one year). However we will have peace of mind during our absence. The next write up will come after our trip to Norway where Caryn will see regions that she never visited whilst living there and she is now returning after an 8 year absence.